You may remember that a few weeks ago I wrote about the Fatberg—a fatty blockage in UK pipes caused by improper disposal of oil, grease, wipes, and other wastes. It seems that now this waste problem is hitting much closer to home. 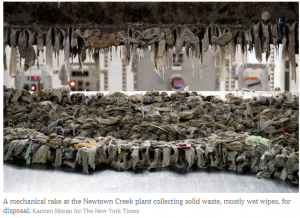 Recently, the New York Times wrote about the toll disposable wipes are taking on the sewage systems in the New York City, as well as cities in California, Hawaii and other states nationwide. Although many of these wipes are marketed as flushable, they do not break down the way that toilet paper does and the wipes can wreak havoc on the wastewater infrastructure. The build up of these wipes, combined with cooking oils and other waste that has been disposed of improperly, leads to somewhat of an indestructible superknot. 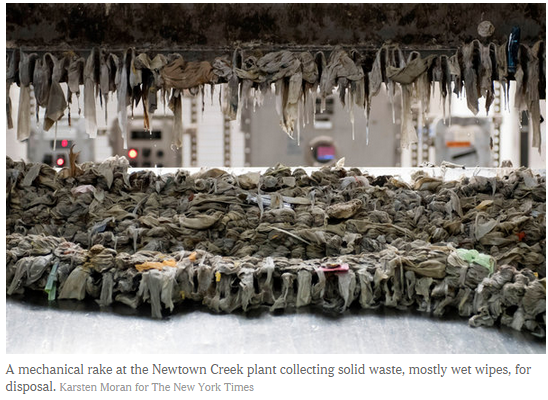 Removal for these superknots created by wet wipes is similar to the process of the Fatberg. So, you wonder why these wipes are labeled as flushable? It’s not that they are falsely labeled, you can physically flush them—but it doesn’t mean you should or that it’s good for your sewage system. For this reason, New York City officials and Mayor Bill de Blasio are working towards a City Council bill to ban the ability to advertise wipes as flushable. In addition, the environmental department has a campaign to make the public aware of proper wipe disposal, i.e. throwing them in the garbage. Only 5 to 6% of wipes are actually designed to be flushable, so that means that most are just improperly disposed of. And while the wipes industry has a standard testing process, it doesn’t correctly imitate the real world’s wastewater infrastructure system. This test allows manufacturers to claim flushability, when in reality products are too durable for treatment systems. The proposed bill can alleviate the misconception that all wet-wipes are designed to flush. Please think twice when disposing of things down the drain or flushing them away; only human waste and toilet paper are safe to flush. While you may think one or two wipes may not cause much harm, if everyone thinks this way it will add up and create long-term infrastructure problems. It starts with just one right decision to begin alleviating infrastructure issues. The industry need to lobby to set a standard for defining”flushable”. RIght now it seems if something can get past the S or P bend then it can be called flushable, no matter what it does afterwards. Wow, thanks for the information. It makes me wonder about other products that are considered “flushable,” but really don’t belong going down the drain. Some things that come to mind are Q-tips, dental floss, baby wipes, and eye make-up remover pads. I never really thought about this before and appreciate the facts. Thanks again for setting the record straight!